Join the Shack Attack fishing charters, and experience the untouched fishing ground off the coast of Cervantes. We provide you with gear, bait and tackle as well as food and refreshments, all you have to do is show up. Join the Shack Attack fishing charters, and experience the untouched fishing ground off the coast of Cervantes. 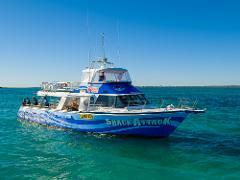 Deep Sea Fishing Charter and a nights stay in a twin room at the Cervantes Pinnacles Motel.